There are few things as pretty as the leaves on campus in October. Everywhere we look the colors of fall are especially brilliant this year. If you were on campus this week you would see that in addition to the usual gold there are spectacular reds and every shade of orange and yellow you might imagine. As I understand it, the tremendous rains that we had in Central Indiana this summer have really created the most beautiful fall display in memory. In thinking about the leaves on campus, I was reminded of this iconic picture by one of our best photographers, Paul T. Mielke [W1942]. Paul was not only a loyal son, but a long serving member of our mathematics faculty. Lucky for us too since he most usually had a camera around his neck. Paul’s picture of the second sign at the corner of Wabash and Grant is full of autumnal gold. It really gives the viewer such a warm feeling for Wabash. Copies of this photo hang around campus and it never ceases to delight me to see it. While looking for Paul’s picture, I also found this lovely picture of the first sign. Taken in the morning by W. Norwood Brigance, a member of the faculty in the Speech Department, it is also a great fall picture and was used on the cover of the 1948 yearbook. The various colors and the shadows really make this a delightful photo, and I love the movement of the student, head down and off to his class. This sign, the first to occupy that space, was created by Byron Trippet to “dress up” the entry to Campus. The Indianapolis alumni thought that the corner was a disreputable first look at Wabash. And looking at old photos, they weren’t wrong. The grass was overgrown and, unlike today, no flowers. So Dean Trippet was charged with the task. 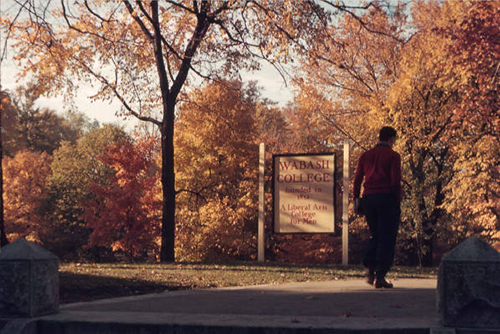 I love his choice of a sign and the simple statement it carries, “Wabash College, Founded in 1832, A Liberal Arts College for Men.” Then and now, the same is still true. 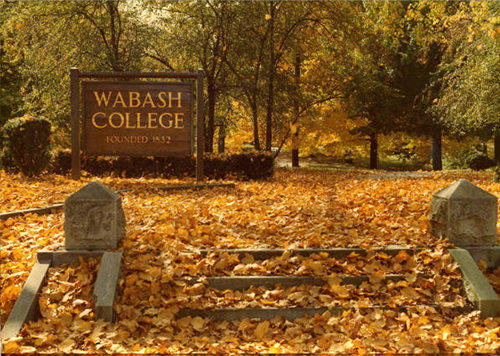 Most Wabash men are more familiar with the wooden signs like the one in Paul’s picture and there was some consternation when the last wooden sign was removed in the early 2000’s. Yet it is true to say that the current sign on the corner more closely resembles the original. In each season the corner is planted with a succession of magnificent flowers, they do really dress up that space. As a welcome to Wabash the corner does just what it was intended to do and that welcome is caught by these beautiful old pictures.